Looking for advice on hemming jeans? Finding a pair of jeans that fits just right can be a challenge. Sometimes, in order to get the perfect fit, you have to go to a tailor and if you have multiple pairs of jeans, alteration fees can add up! Wearing jeans that are too long or too short is always uncomfortable, and oftentimes unflattering. But there are many easy ways to hem jeans to get the look you desire and in this blog post, we’ll share a few of them. Whether you’re taking sewing lessons or just want to learn some money-saving DIY skills, keep reading to learn how to hem jeans in this helpful tutorial. Regardless of which method you use, the first step to hem your own jeans is to measure correctly. You need to find the inseam, the distance between the top of the crotch to the bottom of the pant leg. Once you determine the inseam, subtract that number from the current inseam, and this will tell you how many inches to cut or fold. For example, if your inseam is 30 inches and the jeans are currently 32 inches, you will need to remove two inches of fabric from the jeans. Mark the new hem location using a ruler and chalk or a fabric marker. 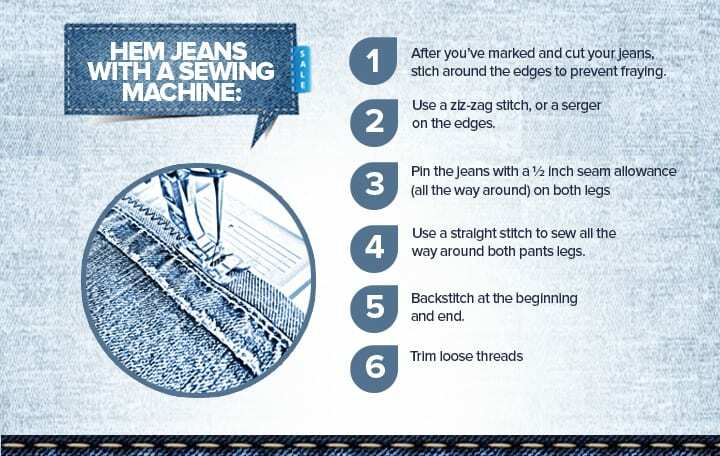 The easiest and quickest method for hemming jeans is to use a standard sewing machine. The process takes around 30 minutes, and if you use the right stitch, your jeans will withstand wear and tear for many washes. It’s very important to use the appropriate needle. I suggest a 100/16 denim needle, but any heavier needle should work fine. After you mark and cut your jeans, stitch around the edges to prevent fraying. You can do this with a standard sewing machine zig-zag stitch, or a serger on the edges. You will need to pin the jeans with a ½ inch seam allowance all the way around on both legs. Now you’re ready to sew! Using a straight stitch with medium length and corresponding thread color, sew all the way around both pant legs, making sure to backstitch at the beginning and end. Trim all loose threads and you’re done! For a finished, professional look, sew around the border of the leg with gold thread. It’s very important to use a straight, even stitch because of the contrasting thread color. 1. Stitch around the edges to prevent fraying after marking and cutting your jeans. 2. Use a zig-zag stitch, or a serger on the edges. 3. 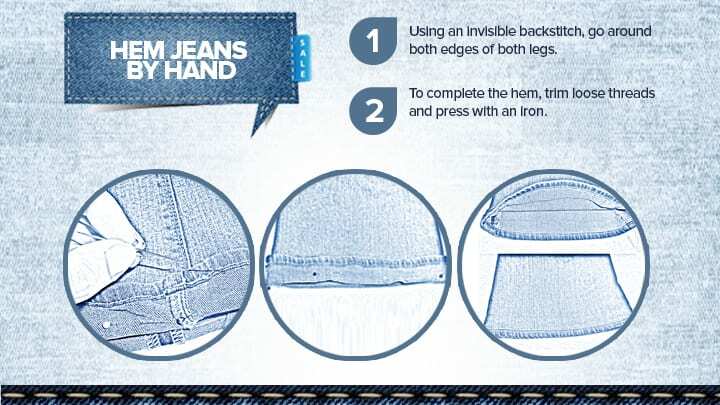 Pin the jeans with a 1/2 inch seam allowance on both legs. 4. Use a straight stitch to sew all the way around both legs. 5. Backstitch at the beginning and end. For hemming jeans by hand, you will need a little more time (close to an hour depending on your stitching speed). You will also need a medium length, heavyweight hand-sewing needle. Follow the same steps: measure and mark the inseam (distance between the top of the crotch to the bottom of the pant leg) and cut or fold the excess fabric. The best stitch to use for hand sewing is an invisible backstitch. This stitch will not be seen, so perfection is not important. It’s also a sturdy stitch that should stand up to as much, if not more, wear and tear as a sewing machine stitch. Make sure to go around both edges of both legs with a few extra stabilization stitches at the beginning and end. To complete the hem, trim all loose threads and press with an iron. You can also use the hand-sewing method to hem jeans with the original hem. This will make it nearly impossible to see that the jeans have been altered. To achieve this look, do not cut the jeans. Instead, take the existing seam and fold it to match the new hem line, and pin it in place. Then follow the exact same instructions for hand stitching. This method is probably the best for beginners to hemming jeans, because you do not have a risk of cutting improperly and ruining the jeans. This is also great if you have young children who may need to have the hem lengthened when their next growth spurt happens! Simply tuck the excess fabric above the hem under the jeans and iron it flat. Once again, make sure to trim the loose threads. Skinny jeans are a little different to hem than traditional jeans. The inseam will need to be a bit shorter because you want them to sit right at the ankle, so remember this when measuring. You also may need to use a stretchy thread if the fabric has more movement than standard denim. Be careful when hemming skinny jeans with a machine. It’s very easy to catch an extra layer in the machine because the leg is so small. I recommend using a hand backstitch to hem skinny jeans. Some people would rather avoid hemming skinny jeans. If you feel this way, make sure to check out this guide for four different ways to adjust your skinny jeans. Jeans are a wardrobe staple for many of us. They can be worn in nearly any situation, with the comfort, look, and durability of the most luxurious fabrics. Unfortunately, every brand has a different size measurement, and every country has a different sizing chart. This can make it challenging to find the perfect pair. The solution: learn how to hem jeans! 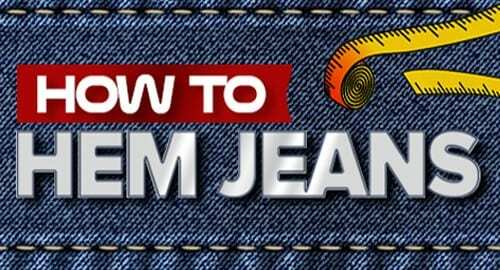 With a little bit of practice, you will be able to hem all of your own jeans. If you need any additional help hemming jeans, make sure to ask a sewing teacher! Kari has been teaching private sewing lessons since 2006. She previously worked in costume design and crafts at the Barter Theatre in Abingdon, VA. Learn more about Kari here! Whether you’re new to sewing or just looking to improve, there are things you can do to take your skills up a notch. Don’t let your garments look “Becky Home-Ecky,” as Michael Kors would say! Even if you aren’t a professional dressmaker or crafter, you can aim for a more professional look. 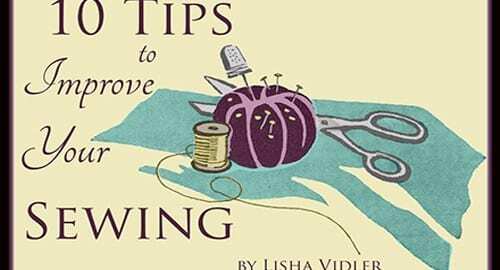 Here are 10 tips to help you improve your sewing. Note: While this article talks about garment sewing, these tips also apply to home decorating, purse-making, historical costuming, and many other types of sewing. Trying to sew without the correct tools is like sewing blindfolded, with one hand tied behind your back! There are tools for almost every sewing task, so find out what exists and give these sewing tools a try. Nancy’s Favorite 101 Notions is a great book for beginners. It’s important not to skimp on quality—always buy the best tools you can afford. What’s the difference between a $5 pair of shears and a $25 pair? Bargain scissors are harder to cut with, they’ll probably go dull quickly, they won’t always cut accurately, they could ruin your fabric, and they may give you blisters or sore fingers. Is it really worth saving a few dollars? Higher-quality sewing tools will last longer and work better, and most importantly—they’ll make sewing a pleasant experience. The same goes for fabric and sewing notions. It’s difficult to make a high-end garment if you’re using cheap fabric! If you’re ready to take things to the next level, start by upgrading your sewing tools. Have you ever washed a hand-made garment only to discover that it shrunk? Or the seams mysteriously puckered? Or the fabric’s texture changed? Or the colors bled? These symptoms can be prevented by pre-washing your fabric. Many sewing notions need to be pre-washed, too. This includes lace, ribbon, decorative braid and trim, zippers, and interfacing, which should be hand-washed and drip-dried. A good fit is one of the key aspects of a professional-looking garment, but it can be the trickiest to learn. Commercial patterns are made to fit a very specific, uncommon body type. If your shape doesn’t match the pattern’s ideal model, you’ll need to make adjustments. There’s no shame in this! Learn your body’s quirks and how to compensate for them. A great guide for common fitting adjustments is Palmer and Pletch’s Fit For Real People. Here’s another tip: take the time to sew a mockup. Sometimes called a muslin or toile, it’s what the experts use to get a perfect fit. Basically, you’re going to sew your garment from unbleached muslin (or some other cheap fabric) in order to test the fit and make necessary changes—without risking your good fabric. Tip: A good source for mockup fabric is your local thrift shop. Look for secondhand flat sheets! Have you ever wondered about the arrows on your pattern pieces? They indicate which direction the pattern should face. The arrows should run parallel to the fabric’s grain. If you cut a pattern off-grain, it may hang oddly. Eyeballing isn’t good enough—take the time to measure from each end of the arrow to the fabric’s edge to make sure the pattern piece is straight. It’s especially important to pay attention to the direction of each pattern piece if you’re working with napped fabric. For this purpose, napped means any fabric that looks different from various angles, such as velvet, corduroy, satin, and shot (iridescent) fabrics. This also applies to stripes, plaids, and directional prints. If you cut some pieces with the arrow running parallel to the selvage and others perpendicular, you may end up with stripes running the wrong way on half of your blouse! Different fabrics require different types of needles. Regular woven fabrics need a universal needle. Knit jerseys, sweater knits, and stretch fabrics require a ballpoint needle. Leather and suede call for a leather needle. Heavy fabrics, like denim and twill, need a jeans needle. Needle size is important, too. The higher the number, the bigger the needle. Bigger needles are intended for heavier fabrics. Note: needles go dull faster than you’d think, so change your needle with every new project. For those of you who despise ironing—it’s not the same as pressing! Strangely, most pattern directions don’t mention pressing at all, yet pressing as you sew is vital. First, press the seam flat, just as it was sewn. This melds the stitching, smoothing it out, so it’s flush with the fabric. Next, press the seam open, first from the inside of the garment, then from the outside. This flattens the seam, making it less visible. After that, if your pattern calls for it, press the seam to one side. This is another crucial step, yet it’s rarely mentioned in pattern directions. If you leave a seam raw, it will fray—especially when you wash the garment. It also looks very unprofessional. The solution is to finish the seams in some way. There are lots of different seam finishes to choose from, such as flat-felling, French seams, mock-French seams, Hong Kong binding, and others. Most are very easy. My favorite finishing technique is overlocking. It’s a method that’s rarely used because most people think you need an industrial sewing machine to do it. The truth is, most sewing machines have an overlock (aka overcast) stitch. Use it with an overlock or overcast presser foot (which can be purchased online for around $12) and you’ll get a beautiful seam finish every time! For seams that aren’t pressed open, cut one side of the seam allowance narrower than the other. Not only does this reduce bulk, but it prevents ridges from showing on the right side of the garment. Convex or outward curves (such as collars), need to be notched. Cut a series of small triangles into the seam allowance, so that when the garment is turned right-side out, the curved seam will lie flat. Concave or inward curves (such as necklines and armscyes) need to be clipped. Cut a series of short cuts into the seam allowance, so the seam allowance can spread open when flipped right-side out. With both methods, alternate the clips on each seam allowance, so you avoid weak points in the seam. Any seam allowance that will be crossed by another seam should have the ends clipped diagonally, to remove excess fabric. Any corner should have the point clipped off—not just once, but three times. First, cut straight across the diagonal corner. Then, go back and cut both remaining corners. This will help create a sharp point when the fabric is turned right-side out. Beginners often have trouble backstitching accurately. If you do succeed in sewing directly over your previous stitch, it often creates a thick seam that won’t press flat, no matter how hard you try. Instead, try this couture method: reduce your stitch length to 1.0 or 1.5 for the first and last half inch of every seam. Don’t worry, it will hold securely—and without the unwieldy bulk of backstitching. If you have trouble sewing a straight line—practice! If necessary, buy a seam guide. They make several different kinds that attach to your sewing machine. (Never use the magnetic kind if your sewing machine is computerized!) Or you can simply place a piece of blue painter’s tape alongside the feed dogs to mark your seam allowance. If you have trouble sewing curves, slow down. Instead of trying to angle the fabric while you’re stitching, stop sewing. Make sure the needle is down, then raise the presser foot and pivot the fabric slightly. Lower the presser foot and sew a few stitches, then repeat. If it’s a very tight curve, you may need to stop and pivot every two stitches. If it’s a shallower curve, you can get away with fewer pivots. Whenever you finish a seam and remove the fabric from the sewing machine, immediately clip your threads. It’s a good habit that will prevent finished garments with messy, dangling threads. This is a technique that’s rarely taught these days. To prevent distorted or stretched-out seams, sew from the widest point to the narrowest, or from the highest point to the lowest. For example, when sewing the side seams of a flared skirt, start at the hem and sew toward the waist. Or when sewing a curved neckline, don’t sew down one side and back up the other. Instead, start at the highest point (the shoulder) and sew to the lowest point (the center of the neckline). Most garments will call for hand sewing at some point, whether it’s basting, hemming, attaching a hook and eye, or crafting buttonholes. The more you practice hand sewing, the better your stitches will look. Here’s four types of hand-sewing you’ll want to master. A long running stitch used to temporarily hold seams together. It’s more secure than pinning, so baste whenever you have a tricky seam, or difficult fabric. Tip: Use a fine silk thread for basting. It’s a dream to sew with, and it pulls out easily once you’re done. Hems often look nicer when hand-sewn. Learn the blind-hem stitch, as well as the catch-stitch. This is an invisible stitch used to close gaps in linings, as well as to attach bias binding. It takes practice to make it truly invisible, so don’t skip this one. Not just for sewing buttonholes! Use this stitch to attach hooks and eyes, to give them a polished look, or as a decorative embroidery stitch. Bonus! When hand sewing, always use waxed thread. It’s stronger and less likely to tangle or knot up. To wax it, first thread your needle and knot the end. Pull the thread through a cake of beeswax several times, until it feels a bit like dental floss. Fold the thread into a scrap of muslin, then press with a warm iron. This melts the wax, fusing it with the thread. One final tip: Keep practicing and keep learning. Don’t focus just on new techniques, but try to refine the sewing methods you already know. Before you know it, you’ll be stitching like a pro! Hopefully, these sewing tips will help you refine your technique and improve your sewing skills. If you have questions, let us know in the comments below! Lisha Vidler started sewing at the age of four, when she crafted Barbie dresses out of Kleenex! One thing led to another, and now she teaches sewing classes in Cordova, TN. Her website, Yesterday’s Thimble, is filled with sewing tips and tricks. There’s no point in starting your holiday sewing projects without an organized sewing kit. Otherwise, you’ll never be able to find what you need. This DIY scissor holder will help you (or a fellow sewing enthusiast) get organized, and keep your precious fabric scissors safe, so that no one uses them to cut anything other than material! A useful, crafty gift for friends or relatives, this project is suitable for absolute beginners and can either be hand sewn or made with a machine. Although this makes a great Valentine’s Day gift, this is the perfect project to bookmark for birthdays and year-round crafting projects. This beautiful felt tablet case isn’t just practical, it’s a cool, thoughtful gift for a teen or adult. You can sew this by hand or use a sewing machine. For an individual touch, try embroidering your own designs on the felt! You might think that sewn toys have to be plushies or difficult-to-follow patterns, but with this simple tutorial, you can make your own matching game. This game is great for young children, and you can make it more challenging if you want to gift it to older kids. Need a shopping bag you can stuff in your purse that’s perfect for that last minute bit of Christmas shopping? Tote bags are simple to make and they’re perfect eco-friendly stocking stuffers. Add a few festive patches to turn this tote into the ideal holiday shopping companion. Pot holders are always useful, either to get hot pans from the oven, to protect your kitchen counter, or in this case, to make you smile while you’re cooking a Thanksgiving feast! Fall into the season with this festive Turkey pot holder; you can make it as plain or bright as you want. It also makes a great gift for friends and family. Add a personal touch to your holiday gathering with this Thanksgiving table runner. This beginner-friendly, hand-sewing project is perfect to personalize each place setting. Your dinner guests can write their names or write down what they’re thankful for this year. If you’re feeling stressed and running out of time to make something with that fabric you’ve purchased for table settings, follow instructions at the end of this table runer tutorial, to make these simple, fancy no-sew napkins. You’d pay good money for fancy napkins from a store, so why not make them yourself? Once Thanksgiving is over, it’s time to start preparing for Christmas, and what is Christmas without a tree and stockings hung on the mantle? You can use these plaid Christmas stockings year after year. They look great by themselves, and they will look even better filled with gifts for your loved ones! Follow this tutorial to make this adorable, cat-shaped pillow. Use Christmas fabric for a DIY gift or holiday decoration, or use non-Christmas fabric for a fun craft project you can do any time of year! Want to make your own beautifully-stitched holiday ornaments? It’s easier than ever with this tutorial. Instead of throwing out leftover scraps, use them to make tree and mantelpiece ornaments. 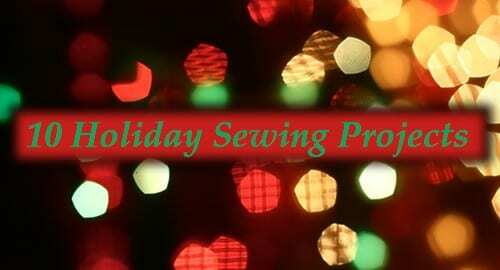 These holiday sewing projects should give you some inspiration for crafts, gifts, and DIY decor. If you need help with any of these projects, be sure to ask your sewing teacher! May 6, 2014 /2 Comments/in TakeLessons Teachers /by Suzy S.
People learn to sew for all sorts of reasons, from a desire to express their creativity, to save money, to even just the need to learn a new skill. I’ve had a life-long love affair with sewing and it’s a skill I think everyone should have. It’s never too late to learn, and as long as your hands can hold a needle and thread, it’s never too early. Here are some of the reasons I think sewing is something everyone should know how to do. Is there a special event coming up in your life: a wedding, prom, or even just a costume party? With the knowledge of how to make your own clothes you can create custom garments that suit you for any occasion. The other bonus? Your outfit will be one of a kind! I made my wedding dress when I married the love of my life and it was such a joy to create something beautiful and unique for our big day. Is Halloween on the horizon? When you learn to sew, you can come up with a creative costume and make it a reality. Are those jeans you just bought too long? Did the zipper on your favorite dress just bust? Did moths make a lunch out of your warmest winter sweater? Do you have an important presentation at work but a button is missing from your blazer? If you have basic sewing skills you can easily and quickly do your own alterations and repairs instead of running to the tailor. Your clothes will fit better and they will last longer, too. Once you know some basics about sewing, you’ll start noticing the craftsmanship in the clothes in the store. Your knowledge of garment construction and fabric quality will help you make better and lasting wardrobe purchases. Anyone will tell you: things used to be made better. Before there were massive overseas factories and clothing that falls apart after one wash, garments used to be made to last, sometimes being passed down from one generation to the next. With sewing skills you can source your own fabrics from green manufacturers, you can use environmentally friendly dyes to make your own special shades, and you can also increase the life of the clothing in your closet by doing your own repairs and alterations. The longer clothes last in your closet, the less clothes end up in a landfill. Sewing is a social activity! Get together with some friends and make a fun project together. Start a sewing circle or throw a quilting bee! Embroidery and embellishments are some of my favorite things to do with friends. Sewing is also a skill you can teach your friends or loved ones, and making your own clothes is a great conversation starter. When someone compliments you on your cool threads you can proudly say, “Thanks, I made it!” Sewing has also brought me a closer connection to my space and the things that I own. I make my own clothes, curtains, pillows, comforters; you name it! I love being able to look around my home and see the things that I’ve made and know that they are going to last. Let’s say you have an important interview and you pull your best suit out of the closet: one of the hems on the leg of your slacks has come undone. You can either rummage for some tape or (this is my dad’s favorite) find a stapler for a quick fix and hope that no one notices the sloppy job. But if you know how to sew a blind hem, it takes 10 minutes and your suit is ready to impress. Need some curtains in your new place? You can find fabric you love and make custom curtains to help you feel at home. Sewing is for everyone! Even Spiderman made his own costume. Sewing used to be a skill that most people knew how to do. It was a necessity, a part of life, a way to solve your own problems, and a way to express creativity. In recent years with the advent of disposable clothing, busier lives, and the lack of good instruction, sewing skills are not taught or passed on. Let’s change that trend together. Whether you have an ambitious sewing project or just want to learn how to take care of your clothes, sewing can help you reach those goals. I hope I’ve shown you just a few of the compelling reasons I think everyone should know how to sew. Iris teaches sewing lessons in Los Angeles, California. She started sewing on her Grandmother’s Singer when she was thirteen years old. Iris attended the School of the Art Institute of Chicago to study fashion design with an emphasis in costume. She’s been working as a costume designer for film, commercials and theater for the past 10 years. She joined the TakeLessons team in April of 2014. Learn more about Iris here!